I've decided to gradually decrease the plain double crochet rows between the lace bands by one. So I started with seven dc rows, now I did 6 before the lace band, next it will be 5, etc. When I'm at one, I'm done! 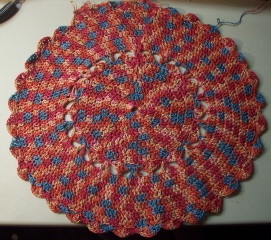 The matching coasters will will be 2 dc rows, the lace band & then one plain row to finish. Thanks for all the supportive comments yesterday regarding Colin's situation at school. I meant to answer everyone individually but I had a VERY full school day & time got away from me here at home last night. So I'll be answering all right here. First, though, I want to say that Colin's problem has been solved. Yesterday the kids had to have emergency subs throughout the day & Colin's class had another math/science teacher at the school. She loved the class and the class loved her. She told my sub coordinator that the class was great, she had no discipline problems, they just didn't know anything because they hadn't been taught! She decided to sell her prep period and take Colin's class for the rest of the year. I can't begin to tell you how thankful I am about that! Of course, that still leaves 3 classes of 8th graders who need a full-time sub, but selfishly I'm happy my kid has been saved! In fact, I left school believing that's what I'd have to do. We ran some errands and when we got home there was a message from P on my machine, telling me that Colin's problem was solved & giving me the info. I thought that was very thoughtful of her to tell me so I wouldn't stew about it over the weekend! Now - back to some of the comments from yesterday. You were all pretty shocked that the original teacher didn't leave better plans & wondered what the heck was up with her. I can tell you she's a relatively new teacher - this is her 5th year - and she ran a very loose class. The kids could have food & drinks, they could listen to MP3 players (which is against school rules) and she allowed late work to be turned in for full credit. The class tended to be on the loud side, although nothing like it was after she left. However, running her class the way she did set up her students for failure when they were confronted with a strict substitute. He didn't allow ANY of the things she did and accepted no late work at all. Anyone walking in there at first was almost destined to fail - especially if they had weak teaching skills. As far as oversight goes, that's a touchy subject for teachers. On the one hand, a teacher wants autonomy. No one wants Big Brother (the principal) looking over your shoulder constantly and questioning your teaching style. I can totally understand that and support it. However, I do think that if a teacher knows he/she is going to be absent for more than a few days, their lesson plans should be more complete than usual AND should be approved by administration. As several of you mentioned yesterday, there's really no excuse for such sketchy plans when the teacher was pregnant ALL year & knew exactly when she'd be going on leave. I do happen to know that the principal was in & out of all of her classrooms several times over the course of the substitute debacles. Several admin people lectured ALL the classes about behavior and their need to settle down. However, the substitute wasn't strong enough and didn't have good enough classroom management skills to follow through on what was said. And unless a teacher writes up a student through the proper channels (2 contracts, followed by a referrel) Admin's hands are tied as far as disciplinary action goes. I think, perhaps, if they had fired the first substitute just a few weeks into his tenure, things might've gone differently. But again - few subs are willing to come to the school and even fewer are willing to take full time positions so firing is always the very last resort. One cool thing happened day before yesterday: My sub friend, G, who has worked at that school for years & used to be an auto sub himself, was in that classroom and while there he tore up all the contracts that had been written on the kids by the two original subs. He told all the kids they had a fresh start and to be good from here on out. So - there you have it. Another tempest in a teacup solved. Colin was thrilled to hear that Mrs. H would be his new teacher. He said she's his favorite sub after me (::wink::) and he was thrilled at how good a teacher she is. He told me in a voice tinged with awe, "Mom, she actually came around to each of our desks, asking us individually if we understood the assignment and if we needed help." Then he said, "And would you believe she spent almost half an hour explaining the assignment on the board? We could actually understand it!" Hearing things like that just makes me want to cry - in both relief and in frustration at what he went through. The poor kid doesn't realize that's what a good math teacher is supposed to do.